Social discovery service Banjo, which launched its cross-platform mobile application for iPhone and Android earlier this summer, has just introduced a new way to keep track of where your friends are and what they’re doing: automatic friend alerts. Unlike the alerts you see on Foursquare, which ping you every time a friend checks in somewhere, this friend alerting feature works across social networks. And more importantly, it only bothers you when your friends are actually nearby. You know what’s annoying? Foursquare telling me that my friend downtown just checked into Starbucks while I’m sitting here at my desk trying to get some work done. I just don’t care. But I do care to know where my friends are when I’m out and about, too. Maybe I’m the one checking into a Starbucks when my friend is doing a little back-to-school shopping just a few shops down. (OK, yes, I’m boring. Feel free to insert “bar,” “nightclub” or “restaurant” here if you have a more exciting life.) But how would I know that my friends are nearby? Until now, I probably wouldn’t have. 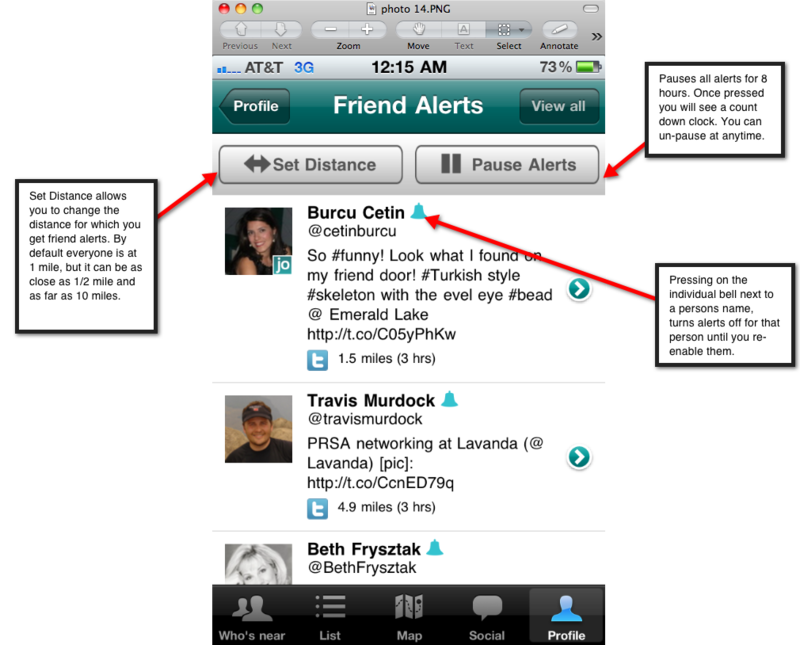 Keeping track of your friends’ activity has typically been more of a manual effort – a somewhat stalker-like activity. You have to launch Google Latitude or Apple’s new “Find My Friends” app. You have to constantly keep an eye on your Facebook, Twitter and Foursquare streams for updates. What’s more useful is a service that simply tells you when your friend is just a block away (or 5 miles away – in Banjo, the choice is up to you). That’s what Banjo is doing now, and it’s awesome. The service, which connects to your Facebook, Twitter, Foursquare and Gowalla accounts, simply sends you a push notification (on either iOS and Android) when a friend is within the radius you specified. And when you don’t want to be bothered, you can turn off the alerts entirely or put them on pause with just a tap. You can even turn off alerts for individual friends. Simple, but incredibly useful. (Note that the ability to specify the radius for alerts is rolling out in a few days. The friend alerts themselves are live now, however). Banjo, which just announced it has now reached 300,000 users, also finds nearby people through geo-tagged updates posted to TwitPic and Instagram. As of yet, those networks are only used for discovery purposes, not to provide alerts. The app is available for download here on iTunes or here on the Android Market.